Bishop Dufour: I'm delighted to meet you. We have an important mission in Bogota. Rafael Acosta: Bogota is in Colombia. Bishop Dufour: The pampas. Of course. I should've known that. Recently I saw a book on Latin America. There were photos of your ancient pyramids. A satire on everyone who's too big for their boots (or secretly wants 2 B), because they will not achieve the aims they pursuit and are ultimately doomed to be separated from their privileges when they wake up to reality. 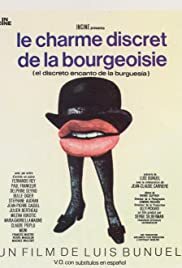 The story may also come across as remote parody on The Last Supper, but from the bourgeois point of view (who never really get their supper), in contrast with 'Viridiana' (1961, Buñuel), where the poor and disabled DO get their Last Supper. But I don't know much about the bible, so I'm probably wrong about that. It proves though that you don't have to be pious to appreciate Buñuel's films; in fact, you'd better NOT be. The 'adventure' of the protagonists is a proverbial sinking ship, because they seem to know what they want, but never reach their goal, which is quite simple and basic (to eat), because they're so caught up in supposed etiquette. They have all kinds of knowledge about manners and gestures, but they cannot sit down and eat. That is actually a fairly clear message: 'look before you leap' or 'behold the priorities of life'. What's more indiscrete: drinking a martini the wrong way, or selling cocaine abusing your position as an ambassador and fooling around in the garden while you're having friends over for diner? And are you ultimately discrete simply because nobody discovers your subversive or criminal actions? These guys just can't control their carnal and financial lust, while complaining: 'No system can give the masses the proper social graces. But you know me, I'm not a reactionary.' Blah. Cinematographer Edmond Richard (Le Procès (1963, Welles), Fantôme de la liberté, Cet obscur objet du désir) exhibits his excellent collaboration with Buñuel's visions. Buñuel tried before to make it easier for audiences to understand the imagery by incorporating it in a dream sequence (e.g. Tristana, 1970), but he returns here (as in Belle de Jour, 1967) to the early days (1930) where the dream sequences were just put forward as if they were reality. You'll never know what is a dream and what is real. As always, there is no music here to guide you, apart from the ringing church bells. Just open up your ears and clean out your eyes and you'll not be disappointed. One last remark: the cover of the video is definitely one of the most applicable and distinctive covers (Ferracci) ever made, as is the cover of 'Fantôme de la liberté' (an odd-faced statue of liberty with a limp torch) by Jean-Paul Commandeur and the cover of 'Cet obscur objet du désir'. Buñuel didn't worry about the surrealism in his own life. He seemed to live in harmony with all his contradictions and hypocrisy.